1. If using active dry yeast, combine the water, yeast, and a pinch of sugar in a small bowl and let stand until foamy, about 10 minutes. If using instant yeast, as I did, you can just mix the yeast in with the flour and omit this first step and the sugar. 2. Combine 2 cups of the flour and the salt in a large bowl. 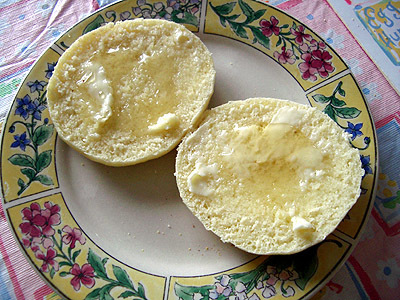 Make a well in the center and pour in egg, milk, butter, and yeast mixture. Mix until creamy, about 2 minutes. Add the remaining flour 1/2 cup at a time, stirring in each time, until you have a soft dough that just clears the sides of the bowl. 3. Turn the dough out onto a floured work surface and knead for 3 to 5 minutes. Return the dough to a clean, greased bowl, cover with plastic wrap, and allow the dough to rise until doubled in size, about 90 minutes. 4. Sprinkle a work surface with cornmeal. Pour the dough out of the bowl and onto the surface. Sprinkle the top of the dough with cornmeal and then roll the dough into a rectangle about 1/2 inch thick. Use a large round cookie cutter or an upside down drinking glass to cut the muffins out of the dough. 5. Heat a large skillet over medium heat. 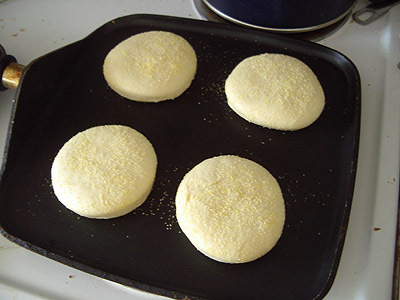 Place the muffins onto the skillet and let the bake for 5 to 10 minutes until quite dark before flipping. 7. An optional step, if you are concerned about baking them all the way through (which I was), is to have your oven heated to 350. After baking the muffins on the griddle for 5 minutes on each side, place them on a cookie sheet and place them into the oven for an additional 5 to 10 minutes. This assures that they are baked through.